I spent years believing that cardio cross training didn’t have much value in a training cycle, not recovering properly and pushing for as much mileage my body could handle. Until it didn’t handle it anymore and I got injured mid marathon build up. As always an injury big or small forces you to take a step back and ask – how did it happen and how can I change my training to fix it? Although my injury was fairly common for runners (stress fracture), it did take longer than usual to heal. This resulted in pool running for 4+ months and giving me time to really rethink my training. People would always say to me keep it up, you will be a better runner when you come back. I tried to believe that but really had some self-doubts. Regardless, I was determined to be a smarter runner and expend my energy in a more efficient and effective way. When I did come back to running, I started up with new training partners and a new plan to reach my Olympic Trials Qualifier (OTQ) goal. My first comeback attempt after 10 weeks was unknowingly pre-mature and quickly ended back in the pool. After that, I decided to wait until the absolutely last day possible to start running again. The plan was to get to the marathon start line ready to race but more importantly guarantee that my injury had fully healed. In August, I slowly began to build up mileage and acclimated to running again. I started by adding in the AlterG Anti-Gravity Treadmill at Finish Line Physical Therapy at 65-75% a few days between pool runs. I slowly added in regular running days as I phased out pool running but maintained AlterG use and gradually brought myself up to 90%. As I got into September and started my 12 week marathon block, I decided to keep cross training and overall lower mileage in the plan. I began to do workouts outside but kept medium long runs of 11-12 miles and usually another day on the AlterG each week, plus one day of easy swimming. It was not all smooth sailing from there. There were some scary days where I’d convince myself that I must be hurt still and the stress fracture was coming back. But what I appreciated the most about the AlterG was that running with even the small % of body weight off, always made me feel safe and that I wasn’t taking any unnecessary risks. I kept the AlterG as part of my weekly routine through almost my entire marathon build up and gratefully reached my OTQ goal and a 4+ minute PR at California International Marathon in December! During the process, I also learned the importance of recovering properly, using the compression sleeves + cryotherapy once a week and massage every 7 to 10 days. 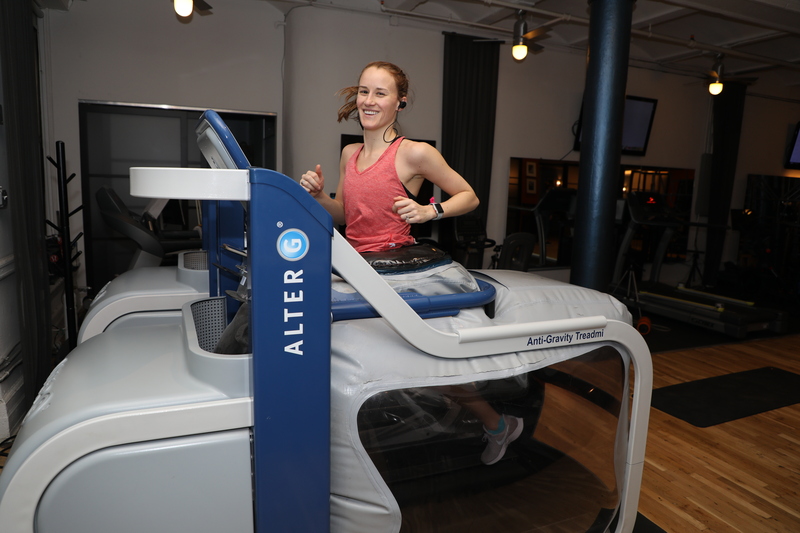 Majority of people think that AlterG is only for people who are injured and/or coming back from an injury and if you use it ground running will seem harder. I did not find that to be the case. Often when I was running on the AlterG, I’d see people that I knew and they’d ask if I was hurt again. I’d smile and say, no not at all and I’d like to stay that way! I saw success in training by keeping AlterG, cross training and recovery tools in my weekly routine, long after I was back from injury. All of this helped me to get fit faster and stay injury free. I’m excited to continue to incorporate the AlterG for my easy day during my winter season, as I focus on shorter distances.